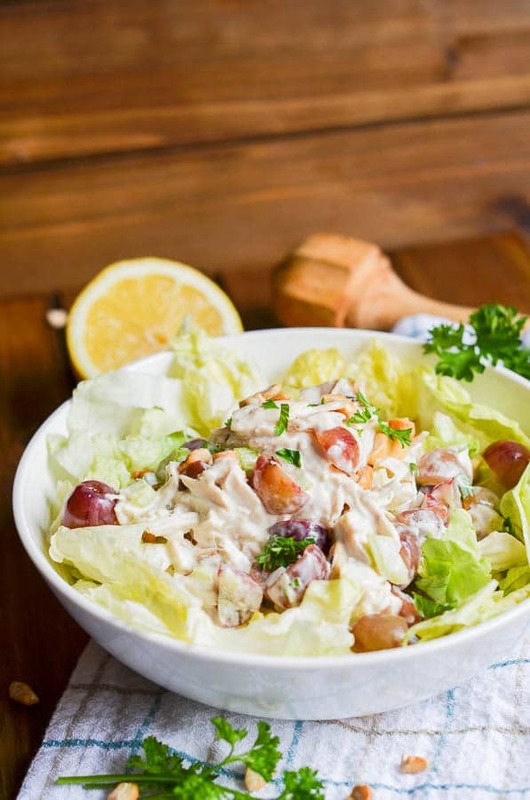 Home » Salad » Amazing Whole30 Chicken Salad Recipe! This Whole30 chicken salad recipe is super tasty, with big chunks of the diced tender easy baked chicken breast, tossed in the easiest and freshest homemade Paleo Mayo Recipe. 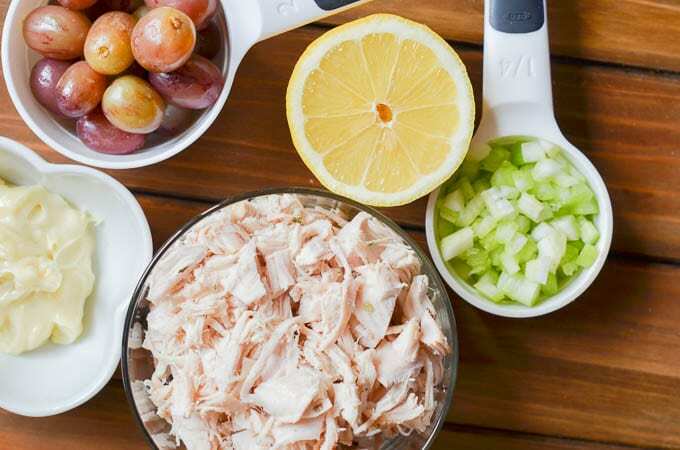 Add a handful of sliced grapes, chopped celery, and seasonings for the best Paleo Whole30 chicken salad with grapes. Later in the post, I’ll give you a list of creative and delicious add-ins that add a bit of crunch, amazing texture and flavor. All optional, of course! So, as I add new Whole30 recipes to this site, you might be wondering, has she actually done the Whole30 diet? But, I want to, and to be successful, I realize delicious recipes are needed. I am the type that plans vacations months in advance, makes lists every day, and can become verklempt when losing a simple board game. Ideally, I’d like every meal planned out for the entire Whole30 month. Planning the Whole30 diet leads to success. Imagine how awesome this Whole30 chicken salad would be atop lettuce or salad greens for lunch or dinner. Baked chicken breast, chopped into bite-sized pieces. Organic grapes (I buy the best-looking grapes whether they are green or red). Whole30 approved mayonnaise. For homemade, try Paleo Mayo Recipe, or Whole30 Mayo. For store-bought, try Primal Kitchen Avocado Mayonnaise. Organic celery, chopped into small pieces. Freshly squeezed lemon juice (half a lemon). Quick dinner with roasted vegetables and shredded chicken. 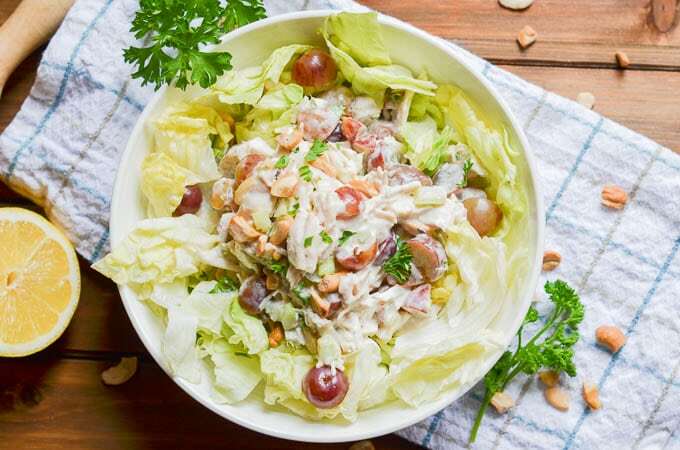 Another option is to use a store-bought rotisserie chicken, a great time-saving and delicious way to make this Whole30 chicken salad super quickly. Add all of the ingredients to a large bowl and mix gently to combine. For best results, store in the refrigerator for at least an hour before serving and eating. Should last 6-7 days stored in an airtight container in the refrigerator. As a sub for onions>>> use 1/2 teaspoon dried chives. Have you done are you doing the Whole30 diet, or do you plan to do it in the future? Would a printable 30 day Whole30 meal plan be a helpful resource for you? And, who wants to play Scrabble? Amazing Whole30 Chicken Salad that is super easy, delicious and perfect for lunch or dinner. Enjoy atop of salad greens or lettuce for the perfect salad. 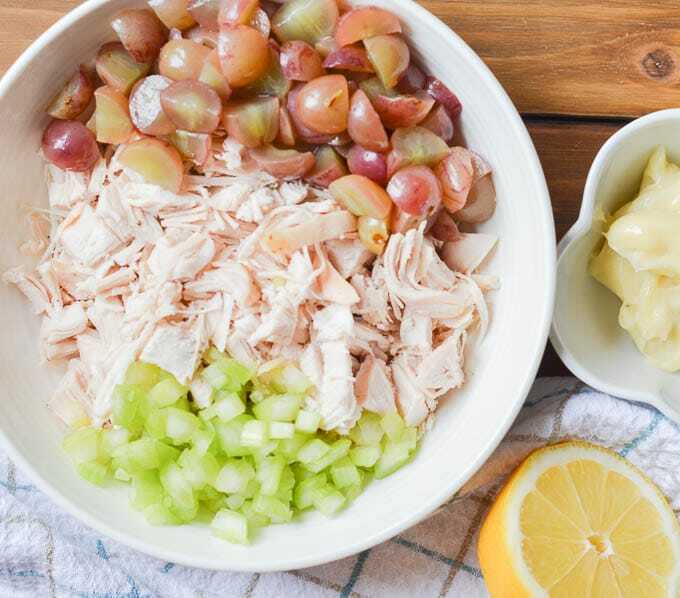 Add the chicken, celery, grapes, lemon juice in a large bowl and stir together. Make homemade Whole30 mayo if not already made. Add the Whole30 mayonnaise to the large bowl and mix into ingredients. Add salt and pepper, taste, and more if needed. Store in the refrigerator for at least an hour prior to serving and eating. 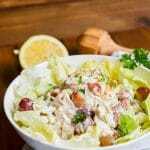 For the Whole30 diet, try a scoop of this Whole30 chicken salad atop shredded lettuce or salad greens. Sprinkle the top with freshly chopped parsley. Note: This post contains Amazon affiliate links. This means that if you click on a link and make a purchase, I will receive a small commission at no cost to you. Thank you for supporting 24 Carrot Kitchen! Previous Post: « How To Make Amazing Vegan Cinnamon Rolls! Hi Beth! Ha! So glad you liked the chicken salad. It disappears quick! It’s such an easy salad recipe with a very few pantry friendly ingredients. I am loving it. Thanks for this post!